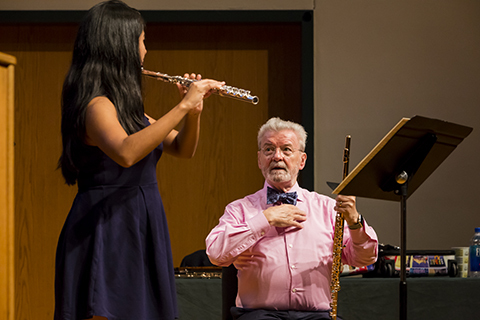 The Frost School of Music and the University of Miami are proud to offer a full range of financial assistance packages rewarding both musically and academically talented students. In addition, based on demonstrated need, students may be considered for state and federal grants, federal loan programs, and college work-study. For priority consideration, freshman and transfer applicants must apply to the University of Miami and to the Frost School. Please visit: How To Apply for the application timeline. To be considered for need-based institutional, federal and state aid, both the CSS / Financial Aid PROFILE (PROFILE) and the Free Application for Federal Student Aid (FAFSA) are required. Please visit the Office of Financial Assistance website for more information and links to the required forms. The Stamps Family Charitable Foundation Music Scholarship is a special scholarship offered to a select group of incoming freshmen each year to form chamber ensembles. It is a full tuition, room and board scholarship. Music scholarships, available only to full-time music majors, are merit and/or talent-based and are given for ability as demonstrated through the audition and academic performance. In some cases, financial need may also be considered in making such determinations. All music scholarships are applied only to tuition and the total of all sources of aid, scholarships, grants, loans, etc., cannot exceed the total cost of attendance and, in some cases is limited by need. For more information about University of Miami Academic Scholarships please visit the Undergraduate Admission scholarship site. For more information about the Cost of Attendance please click here.